One cloudy afternoon in late February, whispering songs of our wood community floated uphill, and escorted by cold air slithered through tiny cracks around my windows and doors and gently trickled into my thought wave. I felt the pull, bundled up, and stepped outdoors. 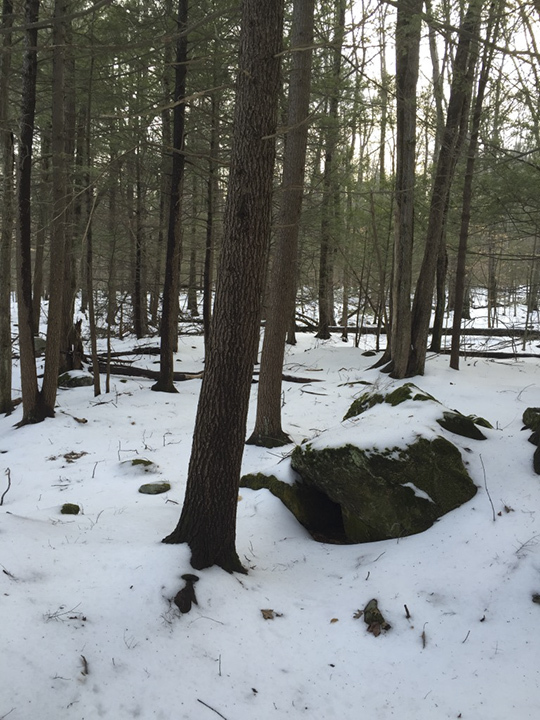 I made my way along the east-facing icy slope pacing myself in my well-worn UGG boots, guided by a resident pileated woodpecker and the snow tracks of wild turkey, bobcat, and deer. The bobcat and deer prints went off in the direction of the south field, but the wild turkey marks led me through the blueberry field and further down towards the forest edge that the woodpecker had already entered. An immediate sense of calm and reverence envelopes me, whenever I step into this world of secrecy, wood, water, and stone. The tall, lithe, vertical stems and their quivering canopies singing and swaying in the breeze hold and create a space of wonder. Not grand as an old growth forest perhaps, but enough to nourish my hunger for the somewhat wild. And these are rooms I know intimately. There, standing in the pine grove, I felt at home and at peace with myself and walked up to many trees saying hello as to old dear friends. My sensory faculties were alive, alert, and in tune with the complexities of the multilayers of life within the forest above and below my feet. Large stones are tossed about the forest floor and smaller moss covered rocks are strewn within several rivulets that crisscross beneath evergreen canopies of white pine and hemlock. 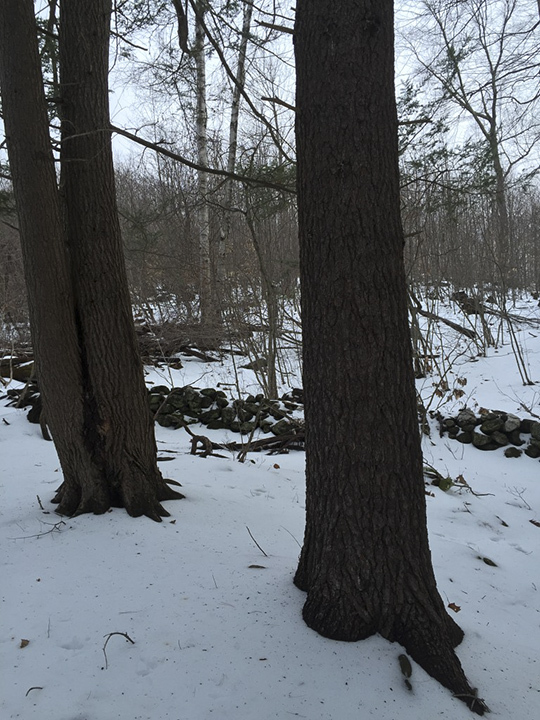 There are stone walls, trees grasping stones, and large boulders placed like monuments among the trees. The photo above was taken just before the one below but further away and from a slightly different angle. Nothing out of the ordinary appears to be present. Or so I thought. I did not see the polar bear snow-rug even when I resized the photo in photoshop. Perhaps because of a habit of seeing this area, I was focusing on the opening within the boulder. 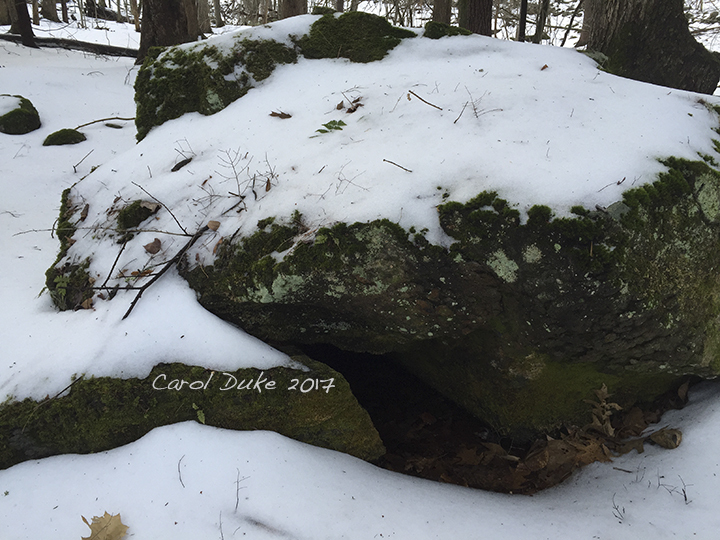 There is a tiny cave-like entrance within the stone shapes, and for decades I imagined some damp and dark loving creature curled up inside. I saw it instantly, once a friend mentioned the form of bear. And, now, cannot look at the photo without seeing a cold mammal mantle covering the mass of moss and rock. It is uncanny how the dark eye of the bear was looking out at me, yet my eyes did not perceive the illusion at the moment I composed this photograph. The image conveys beauty and an ominous sense. The irony of what will become a melting shape of polar bear is not lost on me. That I captured it was purely accidental. When I went back down to the forest a few days later, the bear was not there. Trees and stones hold and anchor each other. Even in winter, the green of ferns surprise and cheer searching eyes. 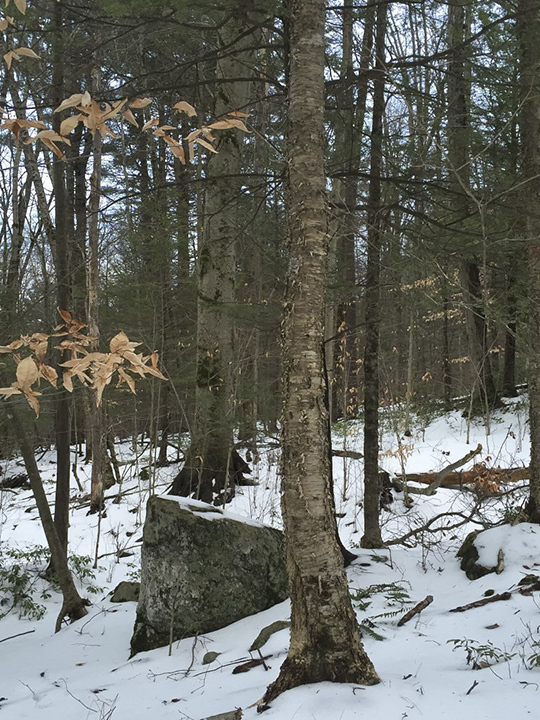 Cluttered by fallen trees and branches, the ten acres of pines and hemlocks along with beech, yellow birch, oak, ash and more hardwoods stand in disarray. Other than picking up debris from paths and from a steady small stream and several vernal rivulets, I allow nature to have her way. The forest is in constant flux. According to Heraclitus we can never step into the same river twice. On this plot of earth it would be more like I can never step over the same rivulet twice. The life within and about these trees is constantly changing, and yet there is a constancy that is enduring. 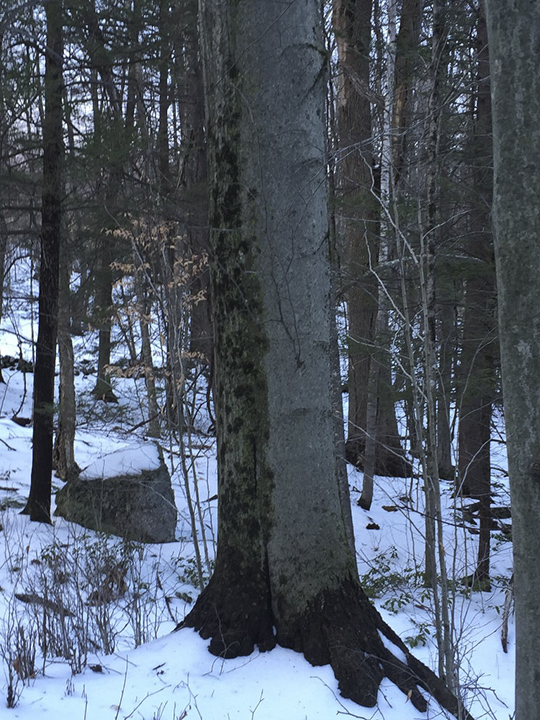 A favorite American Beech (Fagus grandifolia) stands solid and tall upon a knoll. I can never pass by without approaching, gloves off, to feel the elephant skin-like bark and hear the sound when I gently rub and pat the smooth trunk. There are no crowns revealed in these images. But, looking up into this strong tree, the limbs have a wide reach and in autumn offer glowing, golden-bronze hues. In late fall, the leaves turn a buff color hanging on into the winter making music when accompanied by the wind. It is the younger saplings that hold their leaves longest. Though, they barely can hold on to life under the dense crown of the ‘mother’ beech. She will do her best to help them, by passing on carbon and other important nutrients. The fascinating work of Ecologist Dr. Suzanne Simard proves that trees ‘talk’ to each other, they look out for one another and they favor their own species. Akin to the “slow movement” a network of communications exist within the roots of this community; that nurture, sound alarms, and even offer clever defenses for the well being of all the inhabitants. Trees articulate and respond to other living beings and one another through fungi, visual forms, fragrance, and even sound. Here is a great article about Dr. Simard’s work. Our ten acres of forest cannot claim but maybe one or two old growth trees. This dying White Ash (Fraxinus americana) may well be one of them. It has been dying for twenty years or more. Sad to see the bark finally cracking away. 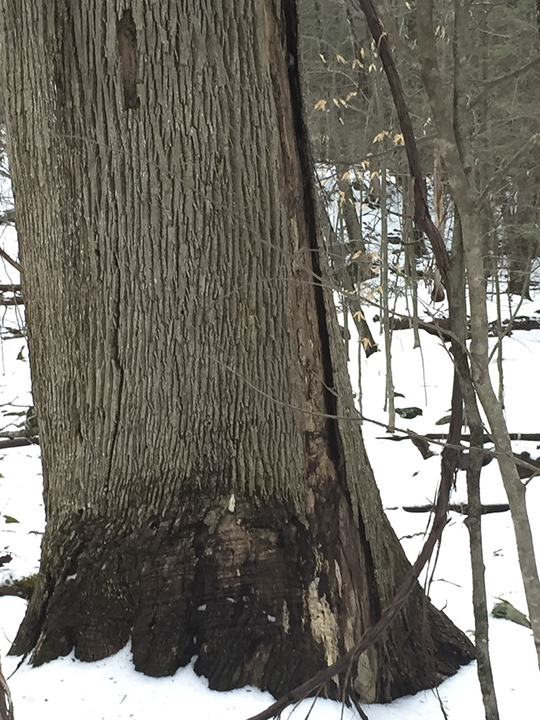 This once majestic tree may well have been a major ‘hub’ or ‘mother’ tree that Dr. Simard’s work shows helps surrounding trees . . . even as it dies. Perhaps the most dramatic scene in the wood is this giant Eastern White Pine (Pinus strobus) that was hit by a thunderbolt years ago. There were four great trunks, growing from a single broad base, before that fiery day when one was killed outright, and another one, seen here, began to die a year later. When I first discovered the wreckage, after the storm, I was amazed to find slices of the pine’s heartwood carved like bolts of lightning that the Roman god Jupiter might have thrown down in a rage towards mankind. The powerful flash of electricity entered the tree’s crown and cracked, shattered, and whittled its core into six foot and longer zigzagged shafts that were sharp enough to fall from the tree and pierce the earth around its wide base. At first, I resented this natural wonder or phenomenon. 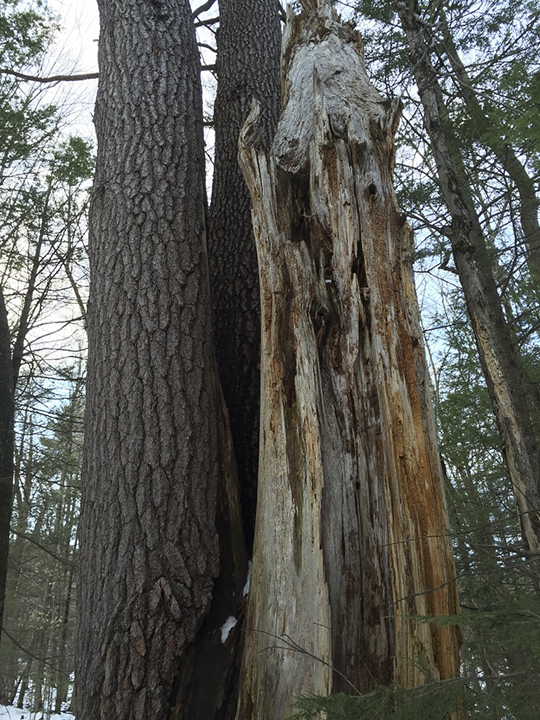 Why harm this old white pine? 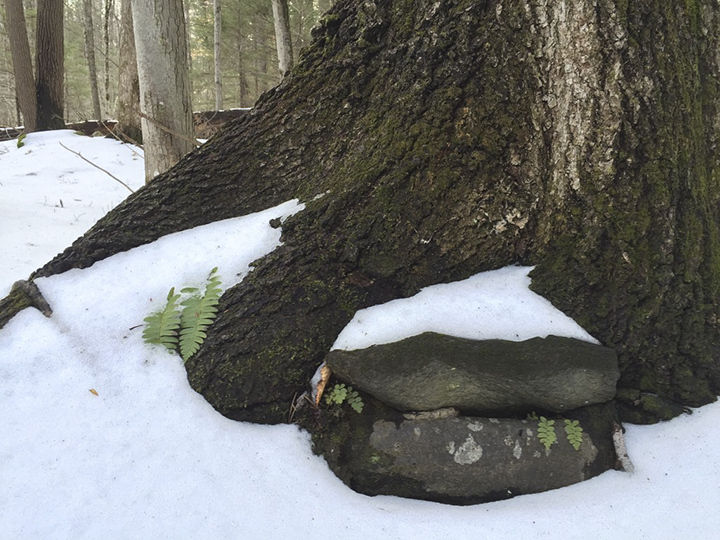 Those emotions quickly welled up from some place deep within me, then the feelings peaked and popped like the bubbles that rise from a spring just thirty feet from where this old sage stands. I had to accept and even admire the destructive force and be grateful for what exists. I found beauty in the ruins of the one huge trunk and wondered how the sudden jolt would affect the remaining three. Over the next years, I witnessed the second one slowly die. Now, a decade has passed and the two surviving massive stems still hold on to life, yet they do not seem to grow taller and their foliage is not the rich green of other white pines nearby . . . that were all about the same size at one time. I can see the tips of this tree’s canopy from my house and barn studio. I cherish this old friend. I imagine my community of wood does too. What I call my little wood is really just a piece of a vast quilt of forest. Where my boundary ends the forest continues and the trees roots and crowns do not know of any such perimeter or confines that limit ownership and responsibility. The entire forest is a unit that feels and communicates as individuals and a whole. Stone walls may keep some animals in . . . but not trees and their root communities. A couple of hours can go by, while I walk through the different moods of the forest. Winter spreads its own character especially with the fabric of snow carpeting the floor, offering more focus on the tree trunks, limbs and branches. On that day, when the forest called to me, I moved along the paths through the various sections or rooms. Fifty steps or so south, beyond the wounded pine, I walked into what I like to call the White Pine Alley where giant pines line a pathway towards a babbling brook. I can also see the tops of these trees from my house. I often imagine a Japanese hut built in this area where the notes from a mini waterfall can slip into my meditation and where I might write, read, and rest. It is good to imagine things and sometimes they become real. I held that thought as I continued on the path towards a stand of tall hemlock and stepping over two rushing rivulets passed through a room with tall twin oaks both leaning in the same direction. Then, after visiting the beech and ash I mentioned before, I climbed over one of the old stone walls and back up the hill to the busyness of my other life. It is a great comfort to me to know that this world exists and that I can return anytime to be with the forest. When not visiting the wood, I try to live my life in a way that helps to protect it and all wild spaces. Now, there is more of an urgency to act both in our daily choices and by reaching out to our representatives. We humans have our important networks too. You can see more glimpses of our forest here. You’re a better sport than I am, for winter makes me stay indoors! But I’m glad you took me along on your winter walk. I just bundle up Robin. There is magic out in the winter landscape. Thanks for coming along for the walk.